Rida en öppen Jeep genom Ho Chi Minh City-kvällen på en guidad rundtur i stadens höjdpunkter, från arkitektur i koloniala tidningar till en elegant takterrass. Du får se några lokala landmärken som lyser upp efter mörker, inklusive Saigon Opera House, den vackra Central Post Office och Nguyen Hue Walking Street, en favorit mötesplats för lokalbefolkningen. Avsluta kvällen över en inkluderad drink på en bar på taket, med fantastisk utsikt över nattlivet. Loved this tour and our guides were fantastic. It was a great way to see the city without the daytime heat and of course the city looked so much nicer at night with all the colorful lights. We loved stopping off at the Air 360 Sky lounge roof top bar for cocktails and a great photo opportunity. We hadn't eaten dinner and the tour finished at about 10pm - our guides were very generous stopping at McDonalds so we could grab something to eat - was shocked that their restaurants shut at 10pm given how lively the city was.... McDonalds was our only option. Johnny was an excellent guide and I loved the restaurants that we visited. I never would have found them on my own. 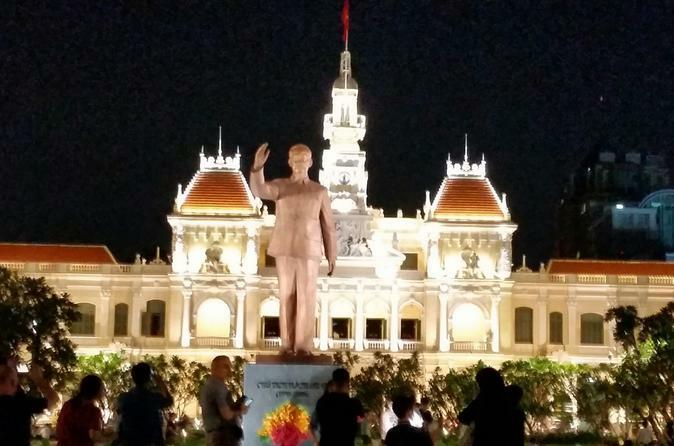 I was visiting Saigon for just two days, I figured a personal tour was best for me and my wife. 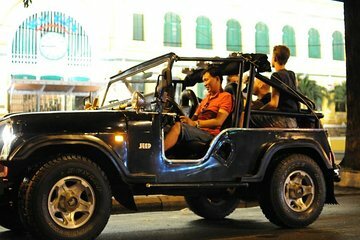 This tour was great..I was able to see the sights in a comfortable Jeep! The driver and guide were great! Very informative and professional. I highly recommend! !